Council of Assiniboia [HBC], “Minutes of a meeting of the Governor and Council of Assiniboia,” dated 25 October 1869, LAC MG 26-A, Sir John A. Macdonald Papers, vol. 102, (11 pages), 40657-40667, http://collectionscanada.gc.ca/pam_archives/index.php?fuseaction=genitem.displayEcopies&lang=eng&rec_nbr=518808&rec_nbr_list=98237,526751,518923,518810,518808,508037,508035,508034,503411,501979&title=[Correspondence].+&ecopy=e007935143-v8&back_url=%28%29. Convention of Forty/La Grande Convention, memorandum, signed by William Coldwell and Louis Schmidt, Secretaries to the Convention, dated 8 February 1870, LAC, MG 27 1, C 6, vol. 1, p. 88, Red River Rebellion 1869-1874 series, William McDougall fonds, http://data2.archives.ca/e/e001/e000007990.jpg. 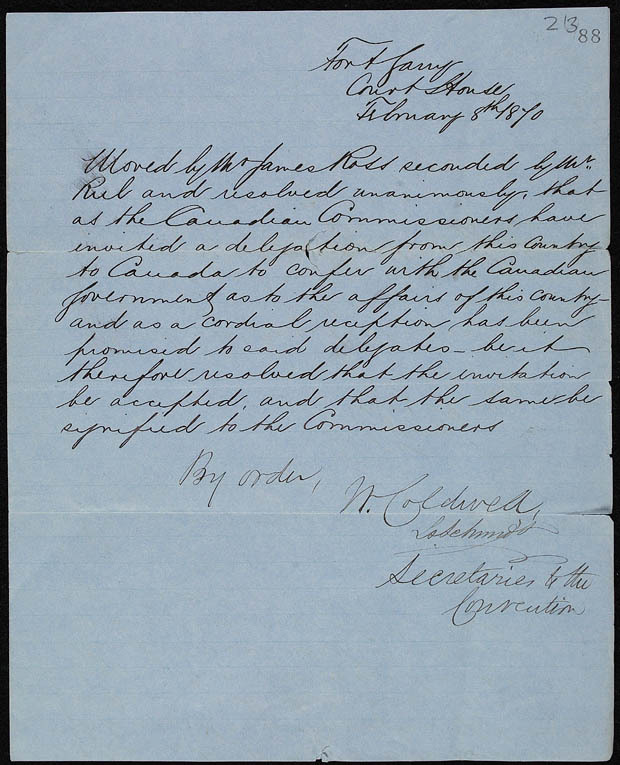 Inhabitants of St. Vital, petition protesting the raid of the home of Louis Riel, to Sir A.G. Archibald, dated 9 December 1871, LAC MG 26-A, Sir John A. Macdonald Papers, vol. 187 (3 pages), 78079-78072, http://collectionscanada.gc.ca/pam_archives/index.php?fuseaction=genitem.displayEcopies&lang=eng&rec_nbr=448352&rec_nbr_list=123044,3993116,3809497,491168,475505,183826,551893,448352,3192491,561001&title=[Correspondence].+&ecopy=e007971194-v8&back_url=%28%29. Petitioners: Pierre Paranteau Sr., Joseph St. Germain, Louis DesRivieres, Mathias Normand, Charles Neault, Paul Prouls, Benjamin Neault, Francois [Royal?] Marion, Pierre St. Germain, Pierre Parenteau Jr., Francois Fribucher, Baptiste Boudreau, Baptiste Laderoute, Louis Dumas, Mathais Sansregret, Joseph Neault, Amable Geaudry Sr., Godefroy Neault, Maxime Lepine, Andre Neault, J.B. Ritchot, Pierre Sauve, Joseph Sauve, Louis Carriere, Damase Carrier, Francois Poitras. A.-A. Tache, correspondence, to Sir Sir. George E. Cartier, dated 18 June 1870, LAC, MG26-A, Sir John A. Macdonald Papers, vol. 103, pp. 41431 http://data2.archives.ca/e/e318/e007935952-v8.jpg and 41432 http://data2.archives.ca/e/e318/e007935953-v8.jpg. [Thomas Bunn? ], ‘Sessional Journal of the Legislative Assembly of Assiniboia,’ Archives of Manitoba, http://www.gov.mb.ca/chc/archives/leg_assembly/journal1_10.html. Louis Schmidt, Typescript, “Les Memoires de Louis Schmidt.” 1911-1912. Archives of Manitoba, MG9 A31, Louis Schmidt Papers. Available online from University of Saskatchewan Libraries Special Collections, Morton Manuscripts Collection, MSS-C550-2-3-20, http://scaa.sk.ca/ourlegacy/permalink/25702. Canada, Governor General (1869-1872 : Lisgar); Great Britain. Colonial Office, Correspondence relative to the recent disturbances in the Red River Settlement [microform] : presented to both Houses of Parliament by command of Her Majesty, August, 1870 (London : Printed by W. Clowes for H.M.S.O. ), Internet Archive, http://www.archive.org/details/cihm_30620. François-Xavier-Anselme Trudel, quoted in Canada, Parliament, Senate, Debates of the Senate of the Dominion of Canada, 1886 (Ottawa:Holland Brothers, 1886), [e.g. 762-764].